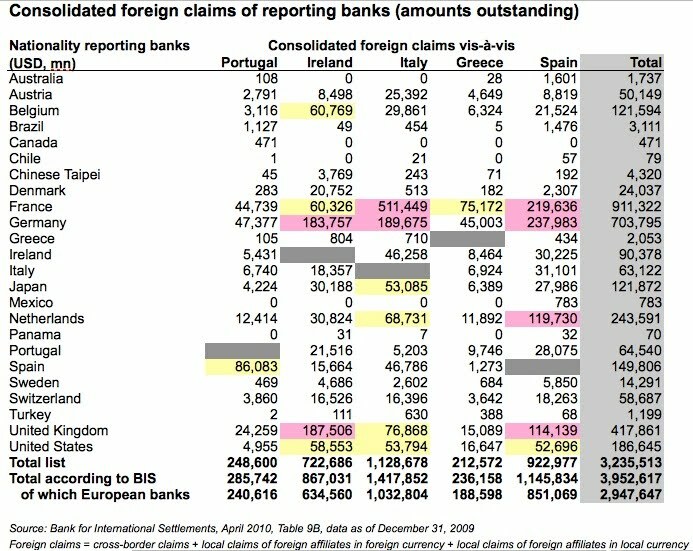 All credit goes to the unknown creator of this table on "Consolidated foreign claims of reporting banks" from data from the Bank for International Settlements (BIS) which landed in my inbox. The pink fields may give an indication about the location of those 3 Eurozone banks that got around half of all government money spent on bailouts so far, blogged here. These bulk risks demonstrate clearly why France presses hard for a bailout solution in the Greek crisis as it stands to lose most in a bankruptcy. 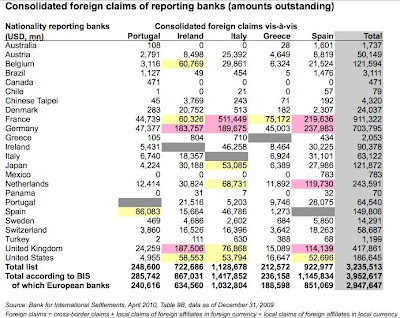 Overall, French banks are the biggest lender to the EUrozone's most troubled nations. What is happening in Europe is nothing less than an attack on a way of life with spurious economic justification. Work does not make free, not then not now.